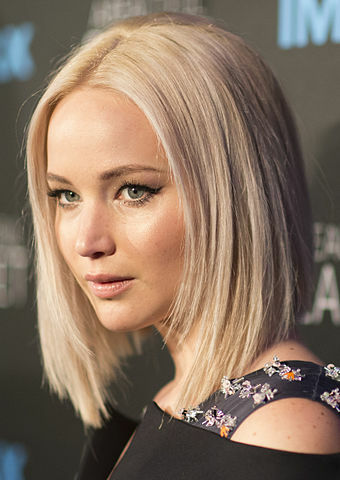 Jennifer Lawrence was born in Indian Hills, Kentucky, United States, on August 15, 1990, is an American hot actress. Young Jennifer Lawrence made her acting debut in the television movie Company Town (2006) in role as Caitlin. She made her big screen debut in drama film Garden Party (2008) in role as Tiff. Her breakthrough performance came as Ree Dolly in the mystery drama movie Winter's Bone (2010) opposite John Hawkes, for which she was nominated for the Academy Award for Best Actress. She won an Academy Award for Best Actress for her role as Tiffany Maxwell in romantic comedy drama film Silver Linings Playbook (2012) with Bradley Cooper. She played mutant Raven Darkhölme / Mystique in superhero films: X-Men: First Class (2011), X-Men: Days of Future Past (2014), X-Men: Apocalypse (2016) and Dark Phoenix (2019). She portrayed heroine Katniss Everdeen in Hunger Games film series: The Hunger Games (2012), The Hunger Games: Catching Fire (2013), The Hunger Games: Mockingjay – Part 1 (2014) and The Hunger Games: Mockingjay – Part 2 (2015). She is one of the the highest paid actress in Hollywood. She dated actor Nicholas Hoult (2010-2014) and British singer Chris Martin (2014-2015). She has no formal acting training. Is a huge fan of actor Jeff Bridges and actress Meryl Streep. Good friends with actress Emma Stone. Play guitar and loves horse riding. Has two older brothers, Ben and Blaine. Lives in Santa Monica, California. For 'X-Men' I was lifting a lot of weights. I actually lost a lot of mass when I quit"X-Men" because I was working out so much and very muscular and strong. I never felt like I completely, 100% understood something so well as acting. I'm still getting used to everything. It still makes me a little emotional, just to see how quickly everything kind of changes -- that it changes so fast. My parents saw me so truly happy that they sacrificed everything for my happiness. Without my family, I would be nothing.